Children from St. Anthony's Nursery School took part in Youth 4 Climate Change Day at Larne Market Yard. Children from St. Anthony’s Nursery School joined pupils from Larne High School gathered at the market yard for Youth 4 Climate Change Day. 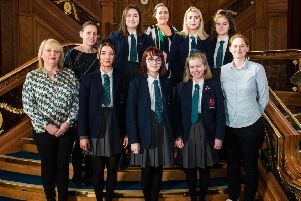 The gathering in Larne was part of a worldwide campaign of children and young people, started in Sweden by 16-year-old Greta Thurnberg, calling on governments around the world to work towards safeguarding the planet and protecting the environment. Pupils from St. Anthony's Nursery School and elected representatives attended Youth 4 Climate Change Day. The children displayed placards which they made to highlight issues such as recycling, endangered animals and pollution. Also in attendance were John Stewart MLA and councillors Robert Logan, Maureen Morrow and Andy Wilson. Participants in Youth 4 Climate Change Day in Larne.